http://www.JewishWorldReview.com | Q: When it comes to a government overhaul of health care, what is the difference between Barack Obama and Mitt Romney? A: Obama was against an individual insurance mandate before he was for it. Romney was for the mandate before he was against it. Actually, that's not precisely accurate. The real difference is that Obama acknowledges reversing his position, while Romney seems to be trying to have it both ways. As a candidate for president in 2008, then-Senator Obama blasted Hillary Clinton's health-care plan because, as one of his campaign ads put it, "It forces everyone to buy insurance, even if you can't afford it, and you pay a penalty if you don't." "I have come to that conclusion," Obama said. "During the campaign I was opposed to this idea [but] I am now in favor of some sort of individual mandate as long as there's a hardship exemption." Compelling nearly everyone to obtain health insurance (or pay a stiff penalty for failing to do so) is the heart of ObamaCare, the linchpin without which the whole scheme falls apart. That's why US District Judge Henry Hudson's ruling last week that the individual mandate is unconstitutional -- and that allowing the federal government to force citizens to buy a private product would "invite unbridled exercise of federal police powers" -- was so significant. The White House immediately fired back -- "We disagree with the ruling," the president's spokesman said. In a Washington Post column the next day, Attorney General Eric Holder and Health and Human Services Secretary Kathleen Sebelius extolled ObamaCare's "individual responsibility provision," and insisted that it would be upheld on appeal. That euphemism for mandating the purchase of health insurance -- "individual responsibility provision" -- may sound familiar to Massachusetts ears. It is essentially the same term Romney used in selling his own health-care overhaul, which also requires everyone to buy health coverage and penalizes those who don't. "It's a personal responsibility principle," Romney maintained, arguing over and over that an individual mandate was the only alternative to letting uninsured "free riders" show up at hospital emergency rooms and get medical care at public expense. In 2006, as he was gearing up for a presidential run, Romney called it "the Republican approach" to say: "Everybody should have insurance. They should pay what they can afford to pay. If they need help, we will be there to help them, but no more free ride." Calling RomneyCare "the Republican approach" didn't make it so, of course. Democrats were closely involved in drafting the legislation, and the late Senator Ted Kennedy -- whom Romney called his "collaborator" on the measure -- headlined the phalanx of politicians surrounding the governor as he signed the bill into law. In most important respects, including the individual mandate, RomneyCare became the model for ObamaCare. MIT economist Jonathan Gruber, who helped prepare the Massachusetts law, told The Wall Street Journal in April that "if any one person in the world deserves credit for where we are now [with the passage of the new federal law], it's Mitt Romney. He designed the structure of the federal bill." If ObamaCare were popular, Romney would presumably be delighted to take credit for siring it. 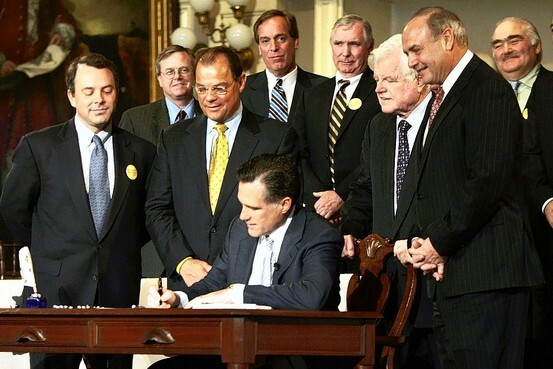 But it isn't popular, and so Romney insists that "there's a big difference" between the law he signed in 2006 and the similar one signed by the president earlier this year. He applauded the court decision last week that struck down the individual mandate as impermissible under the Commerce Clause. "'ObamaCare' is an unconstitutional power grab by Washington," Romney's spokesman said. "We should repeal the law and return to the states the power to determine their own health care solutions." Is it Romney's position that coercive insurance directives are fine when they are imposed by states, and a "power grab" only when imposed by Congress? Does he oppose ObamaCare, with its maze of controls and penalties, as a matter of federalism -- or as a matter of liberty? With medical costs and premiums rising even faster in Massachusetts since health-care "reform" took effect, where exactly does Romney stand? Is an individual mandate still his idea of "the Republican approach?" Most Republicans can answer that question. What isn't clear is, can Romney?